Recommended for musicians, composers, singers for creative ideas. Ideal music for all forms of Sound Therapy and meditation. Archangel Sandalphon assists listeners to balance and settle their energy, harmonizing the energy within body, mind and spirit. If you are feeling insecure at work, home, relationships etc or if you feel threatened in any way, Archangel Sandalphon will help you to become secure. Archangel Sandalphon is very much connected with the earth energies, and you have chosen him to remind you of the importance of being grounded and of being in this world. Archangel Sandalphon will help you to establish a secure link between heaven and earth. Archangel Sandalphon is very aware that it is sometimes difficult to be in the physical world, yet it is an experience we have chosen and we are very privileged and blessed to be here at this important time. Archangel Sandalphon also offers security by teaching us to look within ourselves and reminds us that we are safe and secure in the presence of our angels. 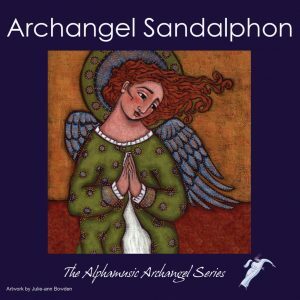 If you are feeling insecure at work, home, relationships etc or if you feel threatened in any way, Archangel Sandalphon will help you to become secure. Archangel Sandalphon is also at the base of the tree of life giving nourishment. Archangel Sandalphon and his minions also channel universal energy into our planet to replenish the earth energy. Archangel Sandalphon will help you to recognise that you are a divine being in a physical body and that this body needs to be nourished and cared for during this lifetime. You could not experience your life without your physical body. You are here to become the best you can be and to overcome the obstacles life throws your way. Although I am normally stable emotionally, I do experience extreme tiredness in parts of the day and have to meditate to recharge. As a result of using this music my meditation periods have been shorter and I have been even more productive and helpful to my clients. For many years I have been searching for music which has the right balance of peace and interesting content so as not to be tedious and at last have found it!